About the time I first learned to read is about the time I knew I wanted to be a writer. But if I’d known at the age of five that to be a writer I can’t just write books, but I must also promote myself and speak in public, I might have looked a little further into alternate potential career choices. 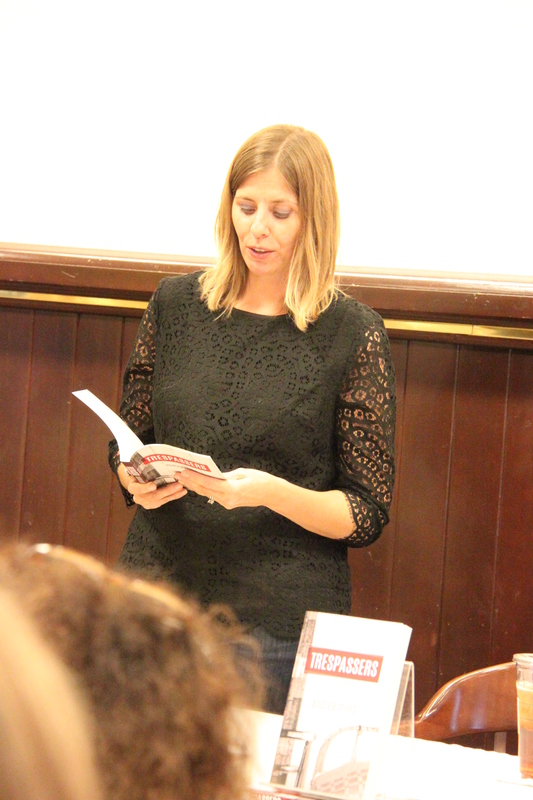 So it was with much trepidation that I approached my launch party for Trespassers. It didn’t matter that the majority of people there would be people who love me and wish me to be successful. I was still nervous. And then I discovered Barnes & Noble had not yet received my books. Funnily enough, that little bit of news was much less stressful than one would expect because my publisher had drilled into our heads that we must always have books on hand. 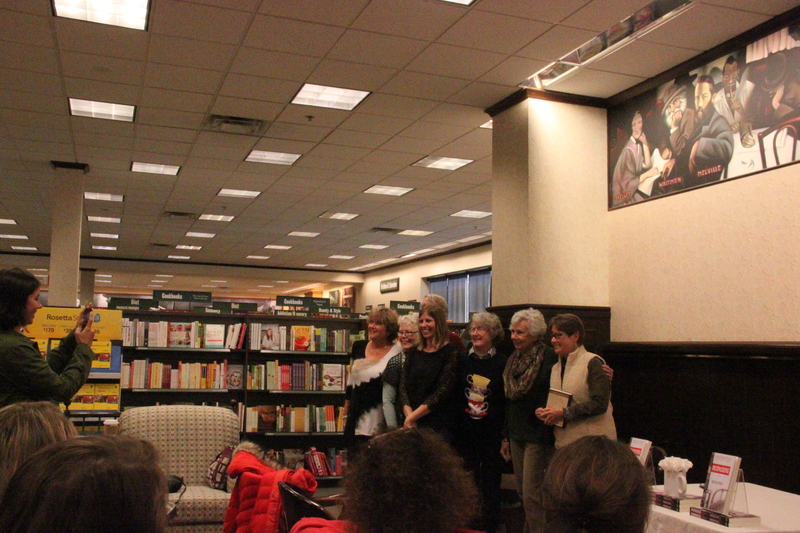 Of course in the scenario she painted, the bookstores sold out of books, not that they had zero books to sell! Nevertheless, I had a box of books sitting in my closet just waiting to save the day. 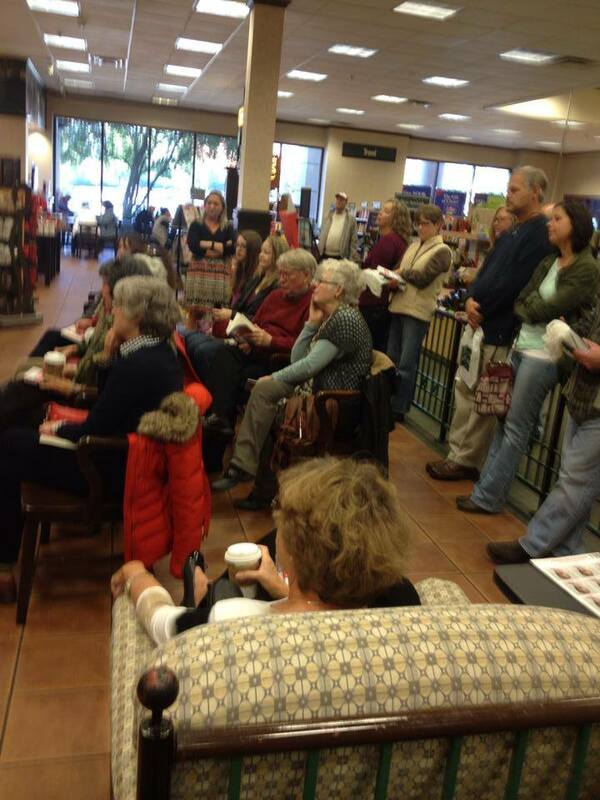 Amanda and Robyn, the folks at Barnes & Noble, felt pretty awful for not having the books. But they were extremely kind and encouraging, assuring me I would be great. 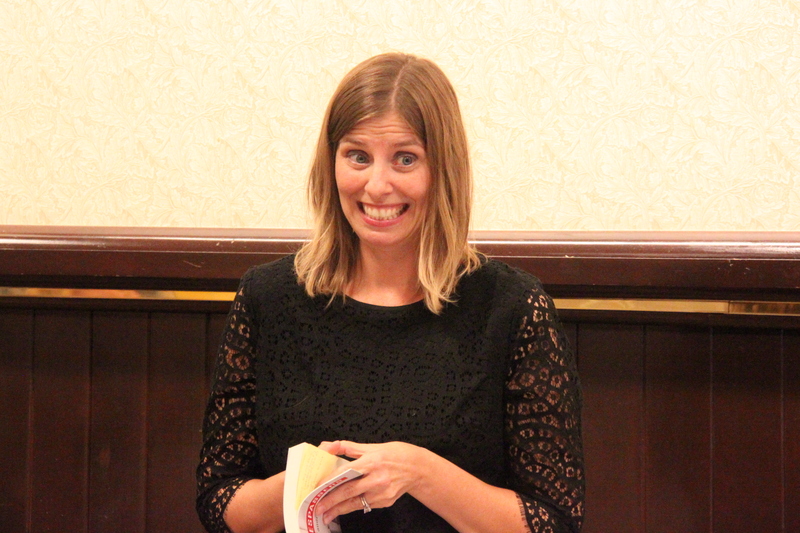 Amanda even told me that she’d read my book the day before and liked it! Now, if she was lying, I don’t want to know about it. It was exactly the kind of encouragement I needed. They also had placed a paper rose on every seat and filled a mug full of them for display on the signing table. In my book there are paper roses that are pretty important to the main character so I was really touched that they did that for me. Of course they didn’t know how to actually make paper roses so they put out a call over the loudspeaker asking if anyone in the store knew how to make them. One gentleman came up and offered his help. He ended up making a bunch of them and got a B&N gift card for his efforts! The signing table with books displayed and a mug full of paper roses! My dad, me, my husband, my three sons. The mustache on my 7 yr old was in anticipation of the toast he intended to make. But the rest of the details are completely fuzzy. My friend Julie introduced me (she was also my photographer for the day) and I remember being so touched with what she said, but I couldn’t have repeated it. I talked, but I have no idea what I talked about. Was I loud enough? I don’t know. Did my answers to the Q&A make any sense? I couldn’t tell you. Mary helped me at the signing table, which was a good thing because who knows what I would’ve signed without her post-its. I don’t remember what I signed. I hope I spelled everything right. Here is Julie introducing me. Here I am with Mary who is helping to ensure I get everyone’s names right! All in all I think it went well. I have asked my friends, my husband and they all said I did great. And I must rely on their word because I really have no idea. 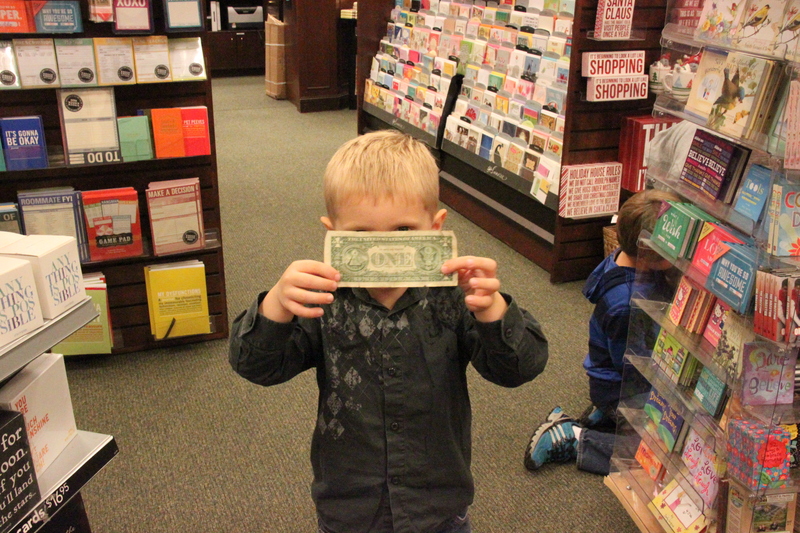 My 4 yr old found a dollar bill on one of the bookshelves! I love this picture. 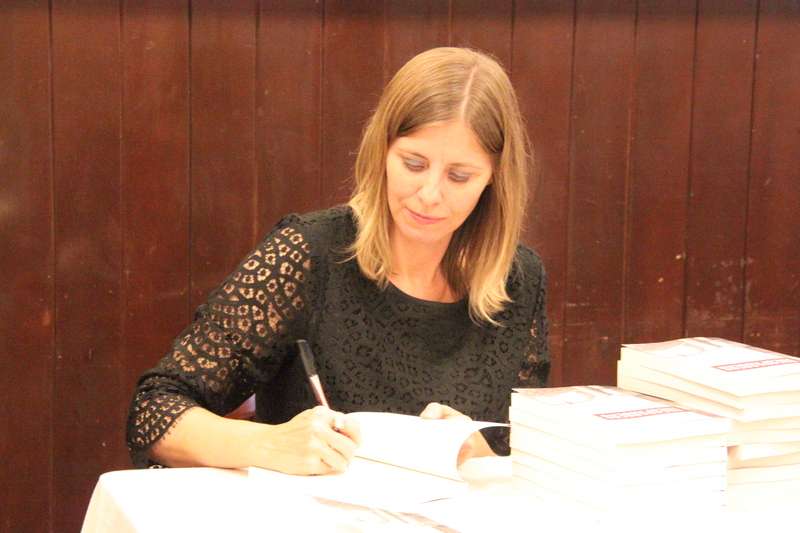 I don’t look nervous at all, but as if I’ve autographed books for years. What a great day! You did fabulous!